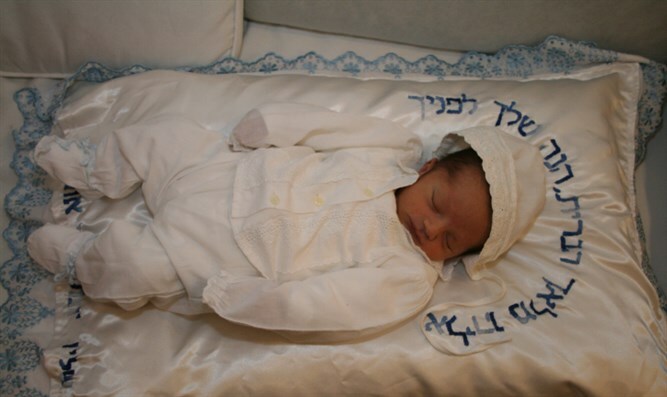 The words "saving the flesh of Israel from corruption" normally said at a brit milah (ritual circumcision ceremony) took on added meaning last week at little Elior's brit mila, where there was not a dry eye in sight among those present. Elior is the son of J, a woman who until recently lived with her violently abusive Arab husband in Kfar Kara. Finally, after ten years of living as Muslim, she succeeding in escaping the town with her children, thanks to the group Yad L'achim. J was born 30 years ago into a large family. She was educated within a Haredi Jewish framework, but suffered abuse from her parents. In her twenties she met an Arab man who worked in her neighborhood. They eventually they married and went to live with his family in a northern village. J relates that she saw in her Arab husband a way to escape her difficult life with her abusive parents. She gave birth to three daughters over the years, all of whom were educated within a Muslim framework. Two years ago, after suffering continued abuse from her husband, J escaped with her children to a shelter for battered women in the north. However, after her husband said he would change and begged her to come back, she complied. The violence against her continued and even got stronger, though, and J soon realized she had made a mistake. She turned to the group Yad L'achim, which helps women in similar situations. The group was able to rescue J from the village and relocate her to a hidden location far from her husband's reach. A week and a half ago, she gave birth to a son; despite all that had transpired and her experience with the child's father, it was clear to her that her son would have a brit milah, according to halacha. She decided to call her son "Elior" (God is my light) "in order to add light to my life."